TRENTON –Trenton Hall Annex, a soon-to-be constructed building on Mercer County Community College's (MCCC) Trenton Campus, will be a work of art, thanks in part to a $60,000 grant from Investors Bank, in partnership with the Roma Bank Community Foundation. Construction will begin this summer on the building, which will house a street-level art gallery open to the public, classrooms, and a multipurpose room, perfect for hosting small concerts. “We think it’s really important to expand our programming here in Trenton, so we are adding new degrees and a new building,” said Patricia C. Donohue, President of MCCC. 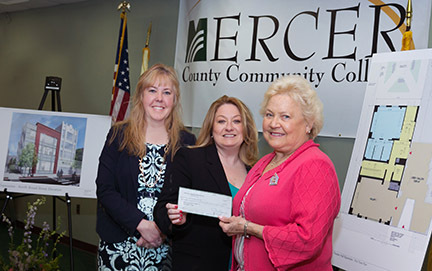 Amy Rouze, Investors Bank Branch Manager in Robbinsville, left, and Linda Martin, Senior Market Manager for Investors Bank, center, present MCCC President Dr. Patricia Donohue with a check to help expand the Trenton campus. “Our history, like the city of Trenton, is founded in art. So this new building will add more art to the program and provide an art gallery. The really great part of this is that it will be on the street so people will literally be invited in," Donohue said. Once completed, estimated around fall 2016, the space will be partly renovated, partly brand new. The renovation portion of the project already is complete and construction will begin on the adjoining building in the next several weeks. The art gallery and multipurpose room are designed for the entire Trenton community to enjoy, not just students of MCCC. On the floors above, there will be classrooms for fashion merchandising, technology and cybersecurity programs, and laboratories for students who are studying to be nurse assistants. MCCC applied for the grant from Roma Bank Community Foundation; Roma Bank became part of Investors Bank in early 2014. The foundation supports non-profit organizations that enrich diverse communities served by Investors Bank. The $60,000 grant will be given in three annual installments of $20,000. The grant re-connected two organizations already linked many years ago by one man, Maury Perilli, a former member of the Board of Directors and Executive Vice President of Roma Bank, now part of Investors Bank. He also was a member of the security division at MCCC. Both parties remembered him fondly. Perilli passed away at the age of 95 in 2013.